The Roland D.IIa was nearly identical to the D.II, but had a more powerful engine. The 180HP Argus As.III engine increased the plane's speed and maneuverability, but because it was a low compression engine, it started to lose power at higher altitudes. 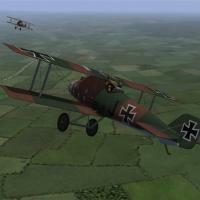 Like the D.II, the D.IIa was quickly replaced on the Western Front, but served until the end of the war on the Eastern and Macedonian Fronts. 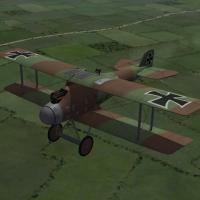 The skins for the Roland D.IIa are nearly identical to the skins for the D.II, but there are some changes to the engine. If you swap skins, you may see some minor stretching on some of the engine components and around the nose of the plane. I have included two new skins, a light green and brown camo, and a dark green and brown camo. I have also included a full set of number decals appropriate for the D.IIa. My skinning templates are included in the download. I didn't have a sound file for the Argus 180hp engine, so I used the sound for the Mercedes 180hp instead. Thanks to Ojcar for making the data file for the Roland D.IIa. Thanks also to Nix, who made the sound file for the Mercedes 180hp engine. 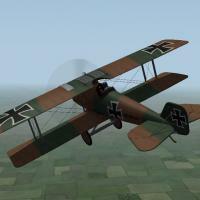 Note - The engine sound file has been used in several other planes. If you already have a file with the same name in your Sounds folder, then you don't need to install mine. 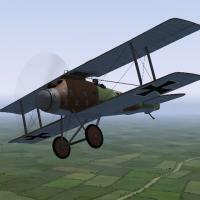 For FE1 - Unzip the file and move the folder named "RolandD2a" into your FirstEagles/Objects/Aircraft folder. If you don't already have it, you will also need to move the sound file "mercedes180m1.wav" into the FirstEagles/Sounds folder. 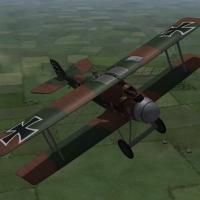 For FE2 - Unzip the file and move the folder named "RolandD2a" into the FirstEagles/Objects/Aircraft folder. Then in the FirstEagles/Objects/Decals folder, create a new folder named "RolandD2a". Move the folder named "D" from the Aircraft/RolandD2a folder into the Decals/RolandD2a folder you just made. If you don't already have it, you will also need to move the sound file "mercedes180m1.wav" into the FirstEagles/Sounds folder.